Henry the Fifth of England was born in the tower above Monmouth Castle in Wales on this day in 1386. Today is the 626th anniversary of his birth. Henry’s birthday was not officially recorded but it is believed to be either September 16 or August 9, and in either 1386 or 1387. He was born into one of the most important families in England. As such, he had the best education and upbringing available at the time. He learned to ride, fight and hunt. In the class room he learned history, literature, and music (he could play the harp) and he could speak English, French and Latin fluently. Because he was born in Monmouth Castle he was referred to as Henry Monmouth during his early life. At that time Richard “invited” 12-year-old Henry Monmouth to be his “guest” at court. Essentially Monmouth was a hostage. If the father returned to England to cause any trouble, the son would be forfeit. Things were not so grim in the Royal castle, however, Richard treated Monmouth kindly. The two became friends. The King even knighted Monmouth. So… Henry Monmouth becomes Prince Hal. He was at his father’s side in battle at the Battle of Shrewsbury. He also fought bravely (and effectively) in Wales, Scotland and France. As his father’s health began to fail the Prince took on more and more responsiblity at court. He became a major political player. Shakespeare’s portrayal of him laughing it up with Falstaff was more dramatic fiction than historic truth. 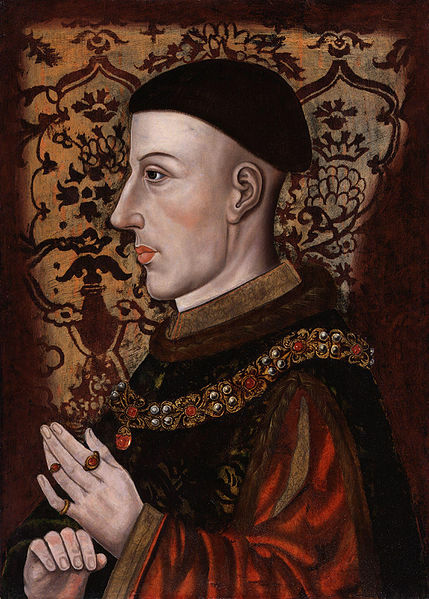 He ascended to the throne upon his father’s death on March 21st, 1413 and was crowned Henry V on April 9th. 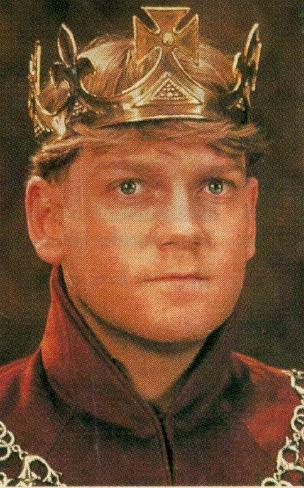 He transferred the remains of Richard II — who died of starvation in Pontefract Castle tower to Winchester Cathedral and gave him an honorable burial. He prepared the nation for a war with France. He straighten out the royal finances by editing royal budgets. He decreed that all government documents be written in English. He tackled the lawless no-man’s-lands and reduced the number of roving bandits (mostly by funneling them into the army.) He crushed the religiously “deviant” Lollards. And he united the people — noble and common alike — behind him. In May 1420 the Treaty of Troyes was signed. 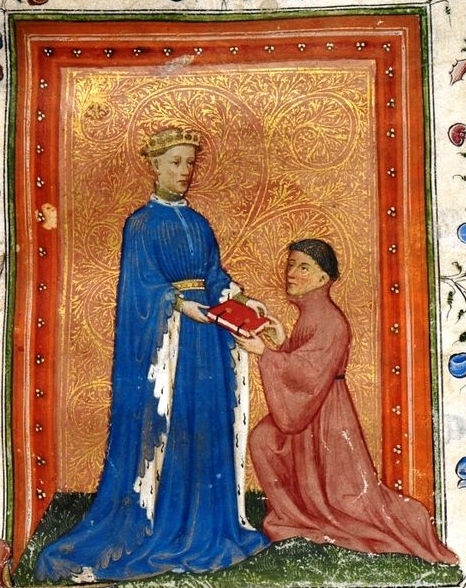 Under the treaty Charles VI remained King of France, Henry married his daughter Katherine, was named heir, and ruled the country in all but name. 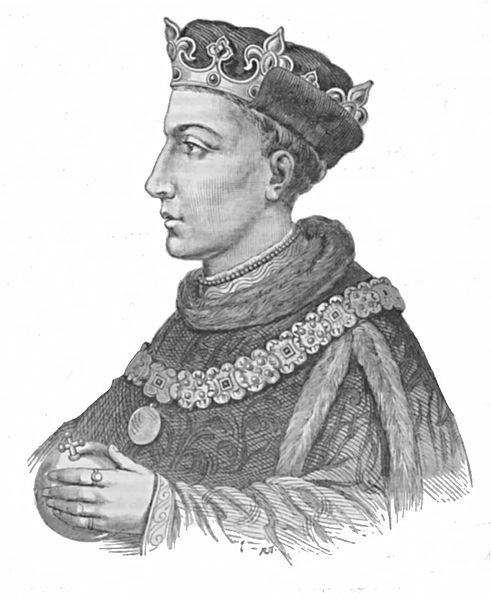 Alas, Henry took ill in 1422 while laying siege to one of the last French hold outs. He lingered for three weeks before dying at Vincennes on August 31st. He was 35 years old. This entry was posted on Monday, September 17th, 2012 at 3:06 am	and tagged with Henry V and posted in England, Henry V, History, Non Fiction, postaday, Shakespeare, Thought of the Day, Today's Birthday. You can follow any responses to this entry through the RSS 2.0 feed.